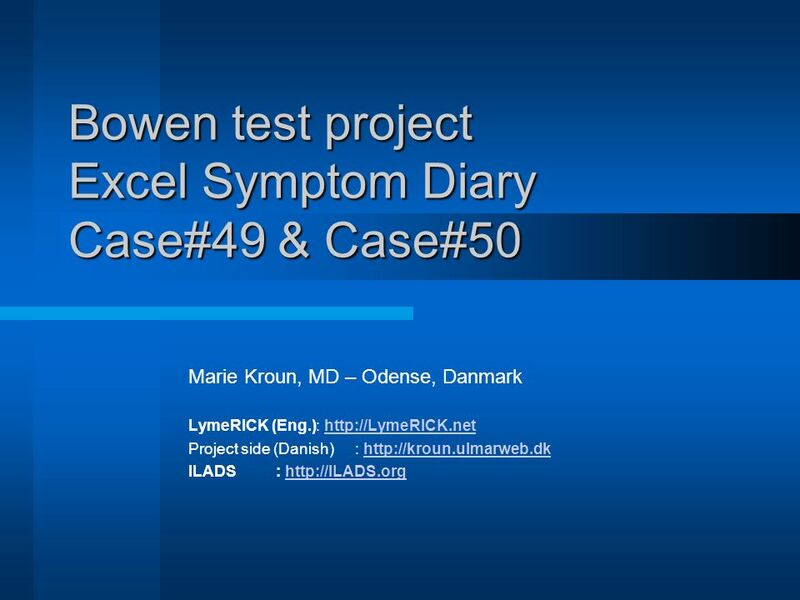 Bowen test project Excel Symptom Diary Case#49 & Case#50 Marie Kroun, MD – Odense, Danmark LymeRICK (Eng. ): Project. 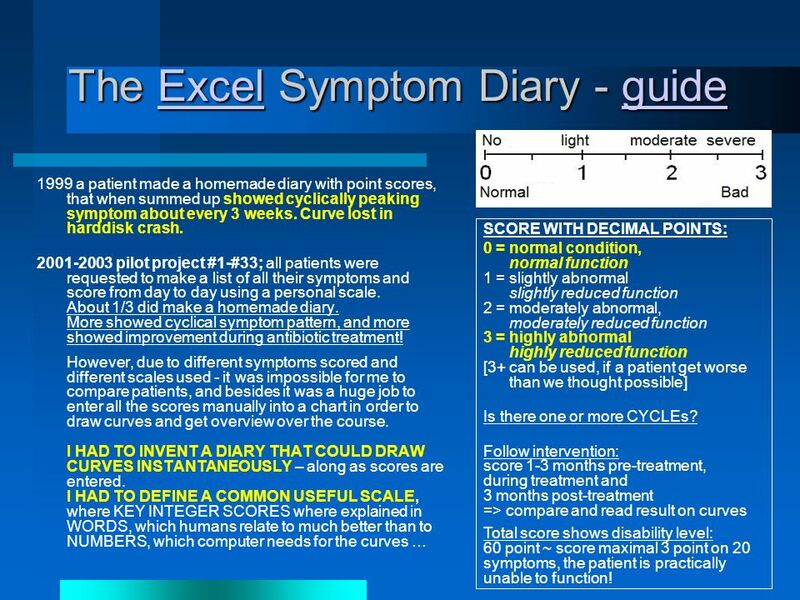 2 The Excel Symptom Diary - guide ExcelguideExcelguide 1999 a patient made a homemade diary with point scores, that when summed up showed cyclically peaking symptom about every 3 weeks. Curve lost in harddisk crash. 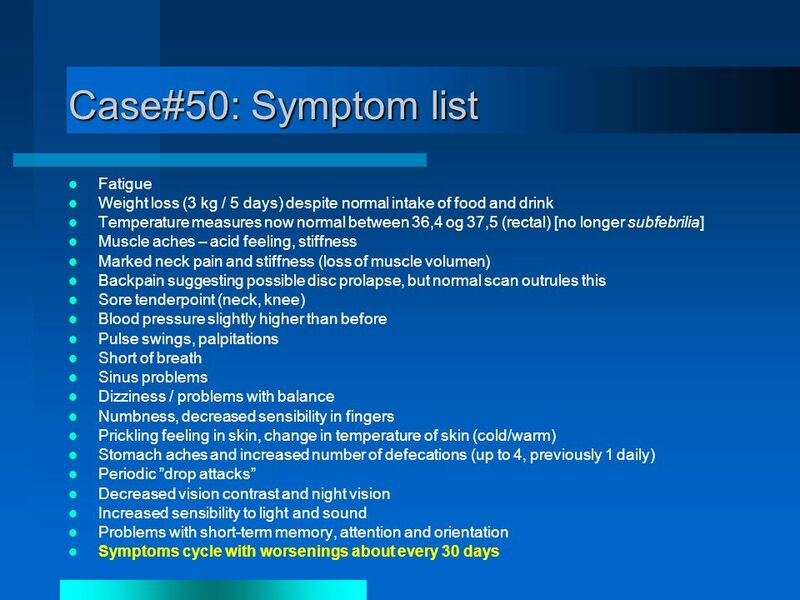 2001-2003 pilot project #1-#33; all patients were requested to make a list of all their symptoms and score from day to day using a personal scale. About 1/3 did make a homemade diary. 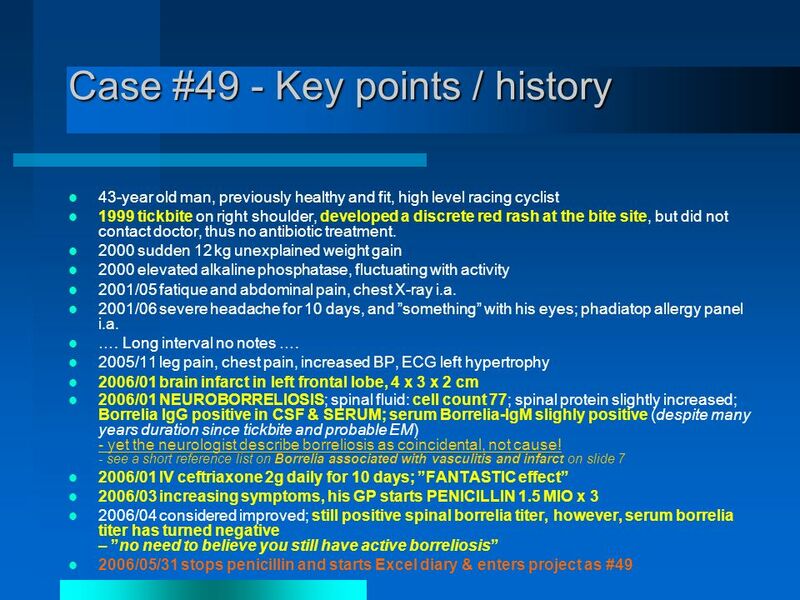 More showed cyclical symptom pattern, and more showed improvement during antibiotic treatment! However, due to different symptoms scored and different scales used - it was impossible for me to compare patients, and besides it was a huge job to enter all the scores manually into a chart in order to draw curves and get overview over the course. I HAD TO INVENT A DIARY THAT COULD DRAW CURVES INSTANTANEOUSLY – along as scores are entered. I HAD TO DEFINE A COMMON USEFUL SCALE, where KEY INTEGER SCORES where explained in WORDS, which humans relate to much better than to NUMBERS, which computer needs for the curves … SCORE WITH DECIMAL POINTS: 0 = normal condition, normal function 1 = slightly abnormal slightly reduced function 2 = moderately abnormal, moderately reduced function 3 = highly abnormal highly reduced function [3+ can be used, if a patient get worse than we thought possible] Is there one or more CYCLEs? 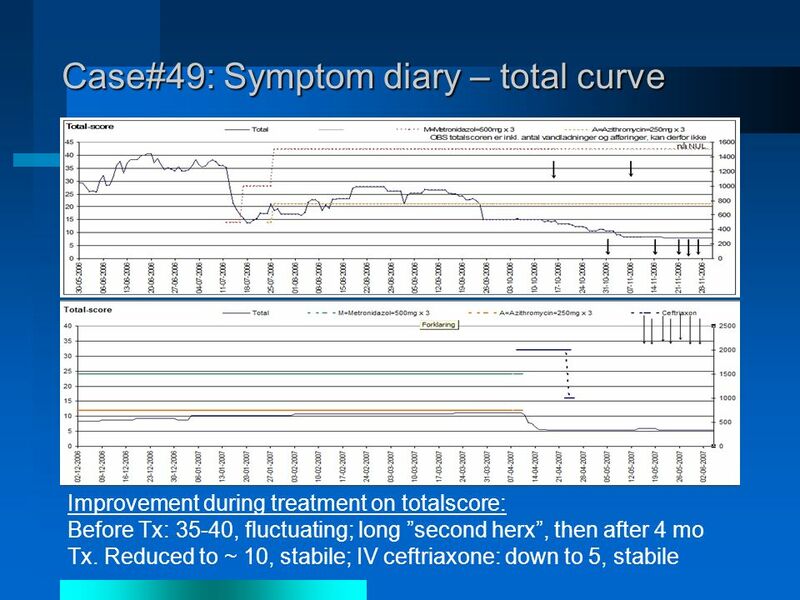 Follow intervention: score 1-3 months pre-treatment, during treatment and 3 months post-treatment => compare and read result on curves Total score shows disability level: 60 point ~ score maximal 3 point on 20 symptoms, the patient is practically unable to function! 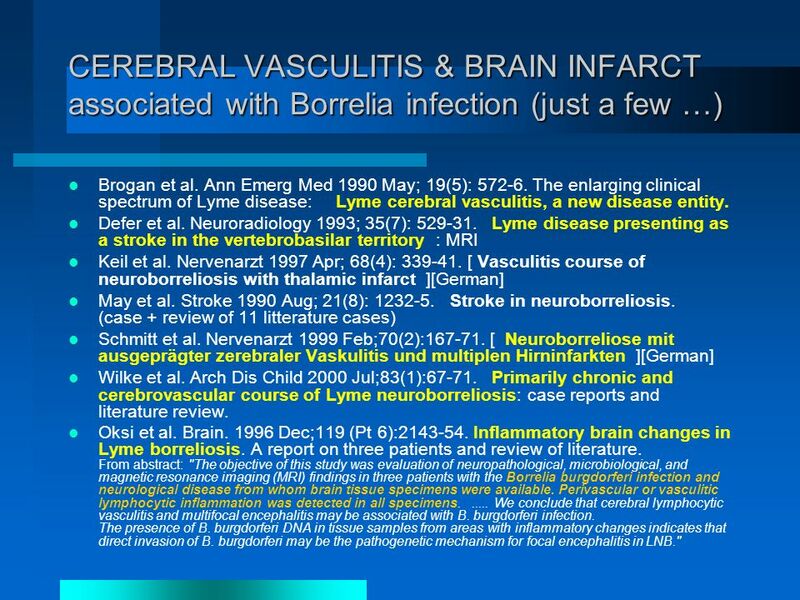 7 CEREBRAL VASCULITIS & BRAIN INFARCT associated with Borrelia infection (just a few …) Brogan et al. Ann Emerg Med 1990 May; 19(5): 572-6. The enlarging clinical spectrum of Lyme disease: Lyme cerebral vasculitis, a new disease entity. Defer et al. Neuroradiology 1993; 35(7): 529-31. Lyme disease presenting as a stroke in the vertebrobasilar territory : MRI Keil et al. Nervenarzt 1997 Apr; 68(4): 339-41. [ Vasculitis course of neuroborreliosis with thalamic infarct ][German] May et al. Stroke 1990 Aug; 21(8): 1232-5. Stroke in neuroborreliosis. (case + review of 11 litterature cases) Schmitt et al. Nervenarzt 1999 Feb;70(2):167-71. [ Neuroborreliose mit ausgeprägter zerebraler Vaskulitis und multiplen Hirninfarkten ][German] Wilke et al. Arch Dis Child 2000 Jul;83(1):67-71. Primarily chronic and cerebrovascular course of Lyme neuroborreliosis: case reports and literature review. Oksi et al. Brain. 1996 Dec;119 (Pt 6):2143-54. Inflammatory brain changes in Lyme borreliosis. 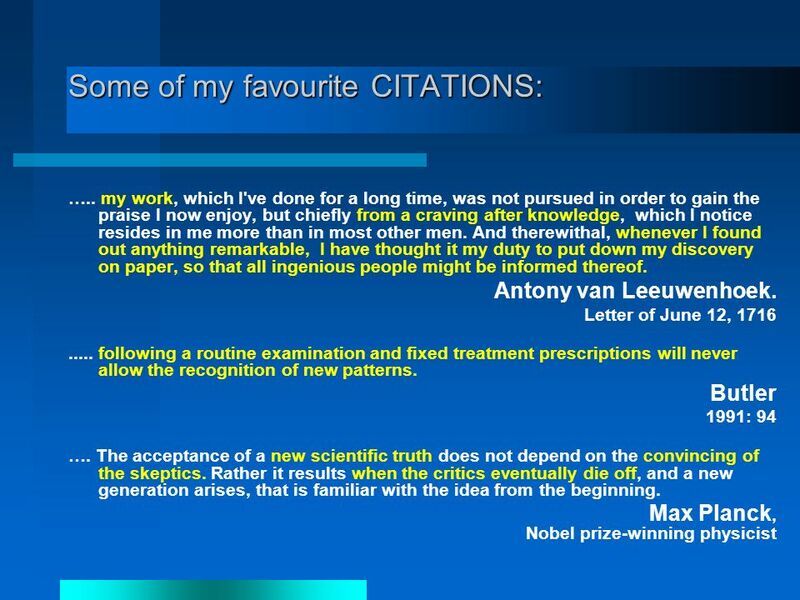 A report on three patients and review of literature. 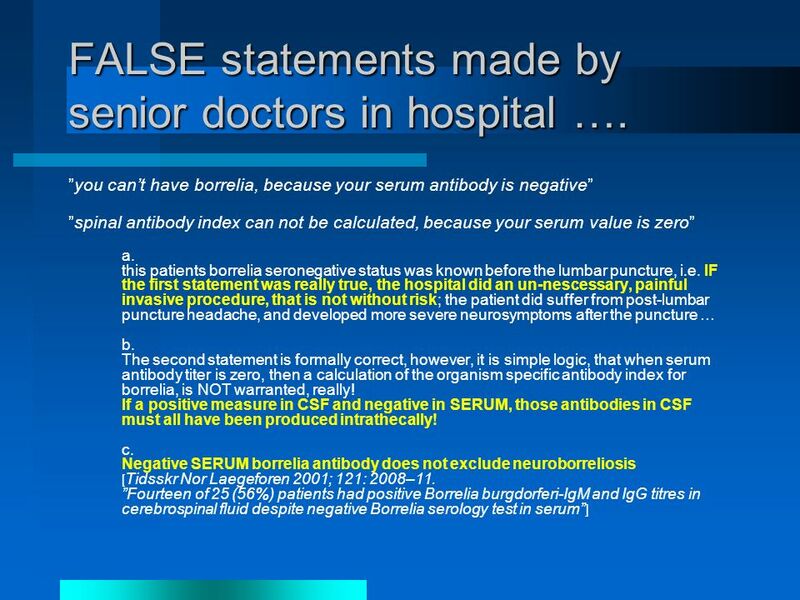 From abstract: "The objective of this study was evaluation of neuropathological, microbiological, and magnetic resonance imaging (MRI) findings in three patients with the Borrelia burgdorferi infection and neurological disease from whom brain tissue specimens were available. Perivascular or vasculitic lymphocytic inflammation was detected in all specimens...... We conclude that cerebral lymphocytic vasculitis and multifocal encephalitis may be associated with B. burgdorferi infection. The presence of B. burgdorferi DNA in tissue samples from areas with inflammatory changes indicates that direct invasion of B. burgdorferi may be the pathogenetic mechanism for focal encephalitis in LNB." 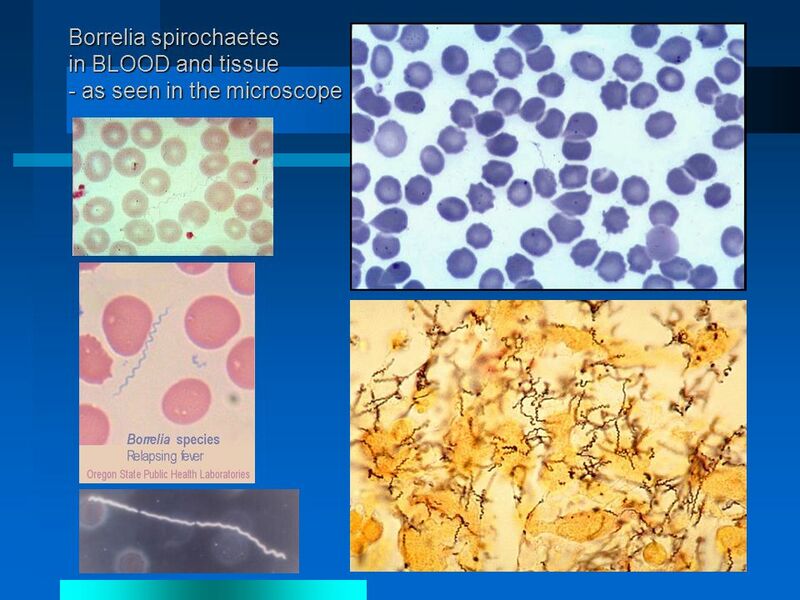 13 It is not possible to see spirochetes / borrelia in the blood by microscopy It is not possible to see spirochetes / borrelia in phase contrast microscopy, only in dark-field microscopy => What MK has found and videotaped in your blood by phase contrast microscopy, can not be borrelia / spirochetes – therefore antibiotic treatment is not warranted in your case FALSE statements often made by senior doctors in danish hospitals …. 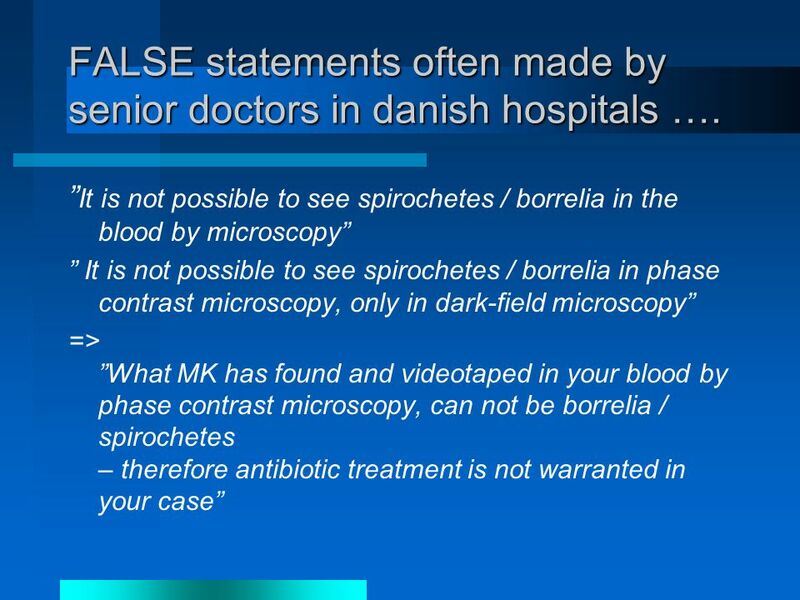 14 These doctors had apparently not read / seen …. DeLamater et al. Studies on the life cycle of spirochetes. VIII Summary and comparison of observations on various organisms. 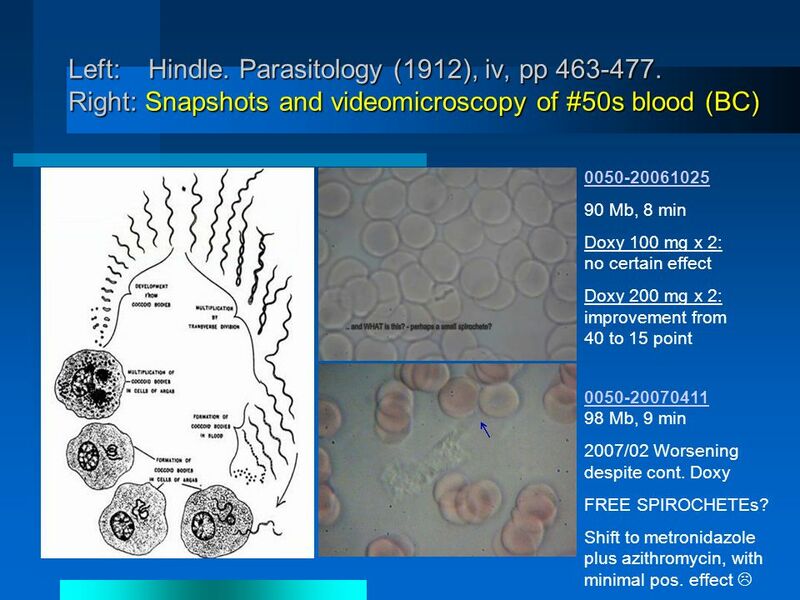 J Invest Dermatol 1951; 16:231-56 By means of the phase contrast microscope the following general story of development of spirochetes appears to be consistent in those organisms studied. The conditions governing the occurrence of the forms observed and reported are under study. In the current presentation representative plates from several of these organisms will be presented in attempting to present the total picture as it has been observed up to the present time. … Authors describe and document by photos multiplication of spirochaetes by: * Transverse fission. * Production of gemmae as a means of vegetative reproduction. * The production of multispirochetal cysts by the aggregation of organisms. * The production of multispirochetal cysts by internal reorganization. MAGNIFICATION X4850 Andy Wrights high resolution videoAndy Wrights high resolution video clips presented on http://LymeRICK.net Shot with the Bradford Microscope (magnification up to X10000) Andy shifts between phase contrast and dark field modes many times, thus show us, that it is possible to see the same structures equally well in boths modes, if the magnification is just high enough! 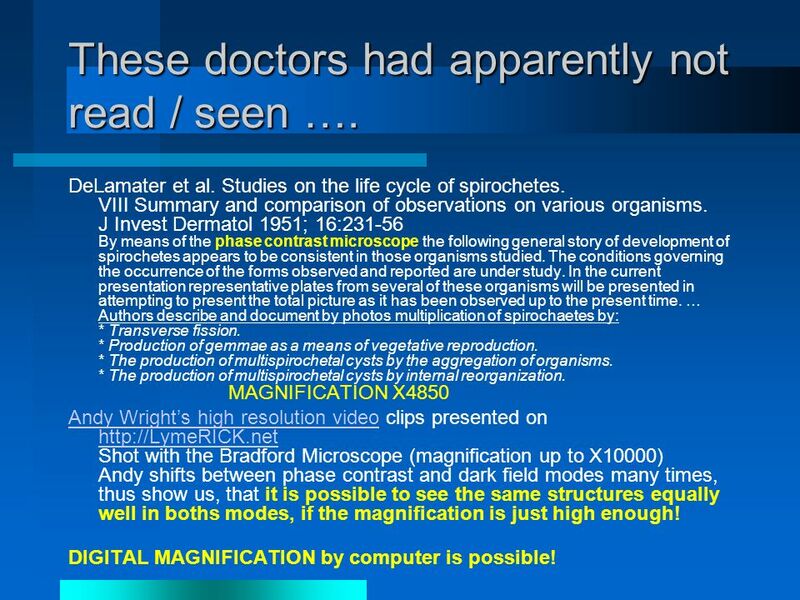 http://LymeRICK.net DIGITAL MAGNIFICATION by computer is possible! 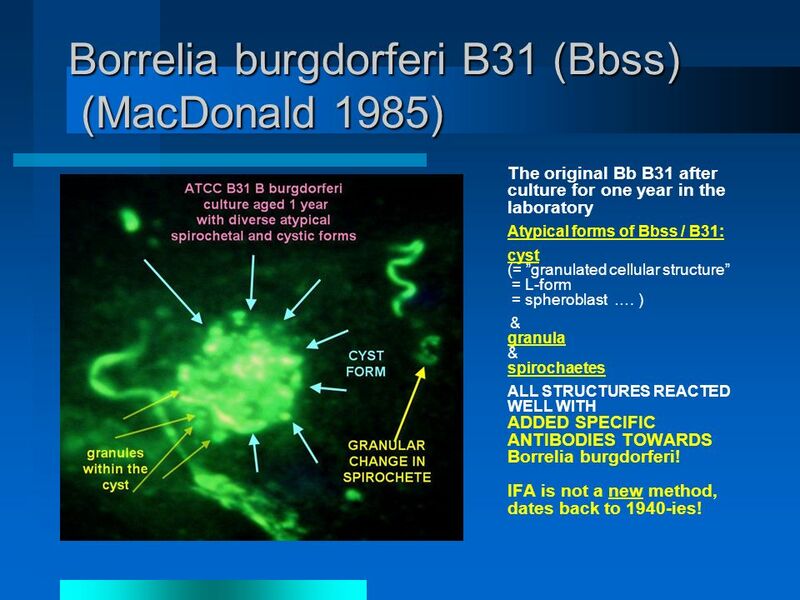 16 Borrelia burgdorferi B31 (Bbss) (MacDonald 1985) The original Bb B31 after culture for one year in the laboratory Atypical forms of Bbss / B31: cyst (= granulated cellular structure = L-form = spheroblast …. ) & granula & spirochaetes ALL STRUCTURES REACTED WELL WITH ADDED SPECIFIC ANTIBODIES TOWARDS Borrelia burgdorferi! IFA is not a new method, dates back to 1940-ies! 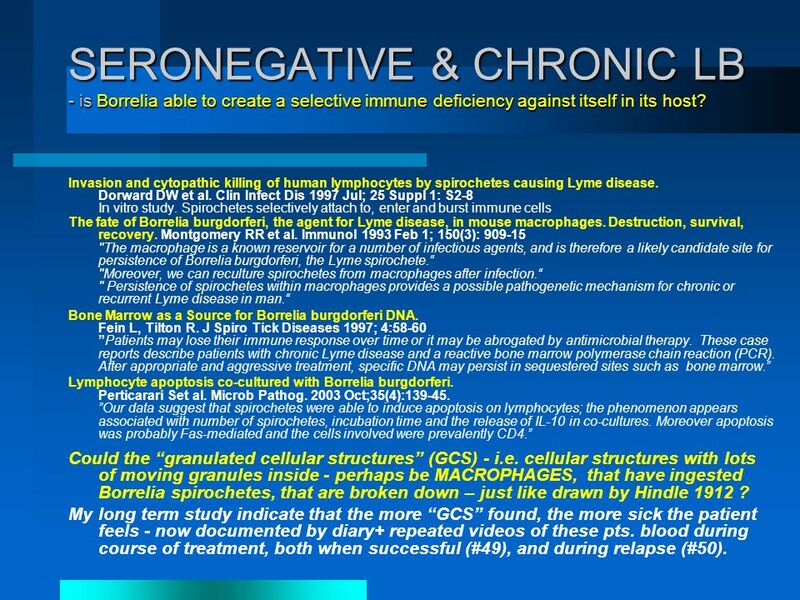 21 SERONEGATIVE & CHRONIC LB - is Borrelia able to create a selective immune deficiency against itself in its host? Invasion and cytopathic killing of human lymphocytes by spirochetes causing Lyme disease. Dorward DW et al. Clin Infect Dis 1997 Jul; 25 Suppl 1: S2-8 In vitro study. Spirochetes selectively attach to, enter and burst immune cells The fate of Borrelia burgdorferi, the agent for Lyme disease, in mouse macrophages. Destruction, survival, recovery. Montgomery RR et al. 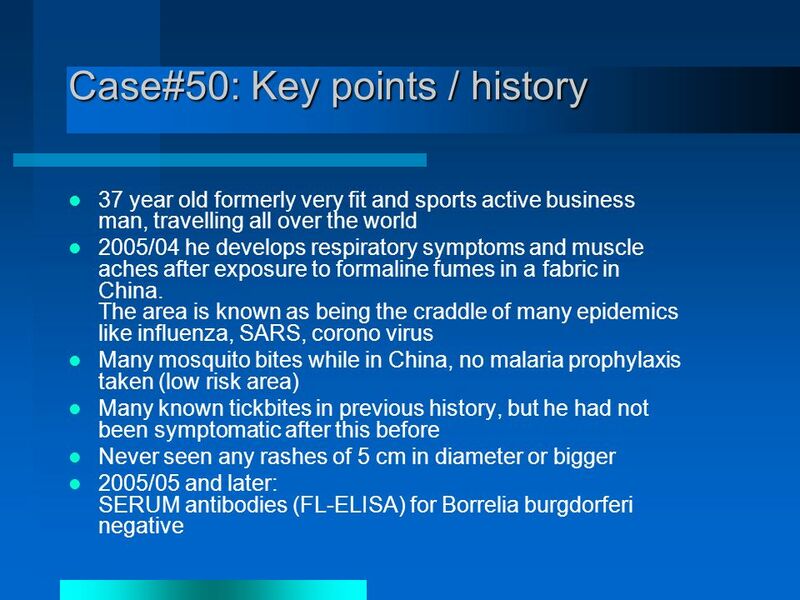 Immunol 1993 Feb 1; 150(3): 909-15 "The macrophage is a known reservoir for a number of infectious agents, and is therefore a likely candidate site for persistence of Borrelia burgdorferi, the Lyme spirochete. "Moreover, we can reculture spirochetes from macrophages after infection. " Persistence of spirochetes within macrophages provides a possible pathogenetic mechanism for chronic or recurrent Lyme disease in man. 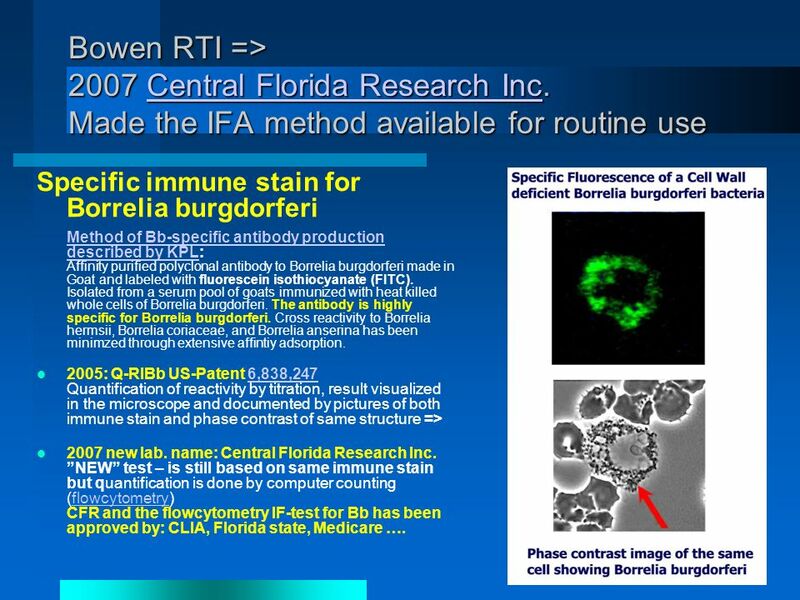 Bone Marrow as a Source for Borrelia burgdorferi DNA. Fein L, Tilton R. J Spiro Tick Diseases 1997; 4:58-60Patients may lose their immune response over time or it may be abrogated by antimicrobial therapy. These case reports describe patients with chronic Lyme disease and a reactive bone marrow polymerase chain reaction (PCR). After appropriate and aggressive treatment, specific DNA may persist in sequestered sites such as bone marrow. Lymphocyte apoptosis co-cultured with Borrelia burgdorferi. Perticarari Set al. Microb Pathog. 2003 Oct;35(4):139-45.Our data suggest that spirochetes were able to induce apoptosis on lymphocytes; the phenomenon appears associated with number of spirochetes, incubation time and the release of IL-10 in co-cultures. Moreover apoptosis was probably Fas-mediated and the cells involved were prevalently CD4. Could the granulated cellular structures (GCS) - i.e. cellular structures with lots of moving granules inside - perhaps be MACROPHAGES, that have ingested Borrelia spirochetes, that are broken down – just like drawn by Hindle 1912 ? 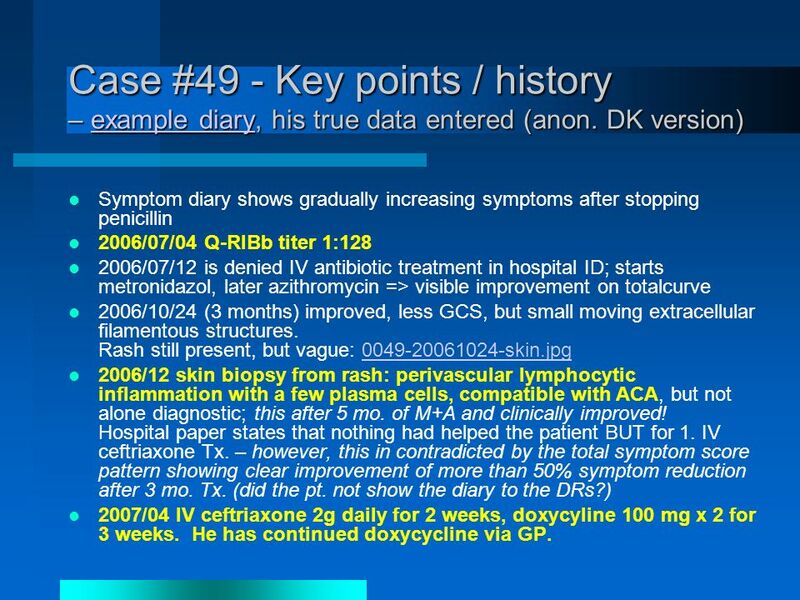 My long term study indicate that the more GCS found, the more sick the patient feels - now documented by diary+ repeated videos of these pts. 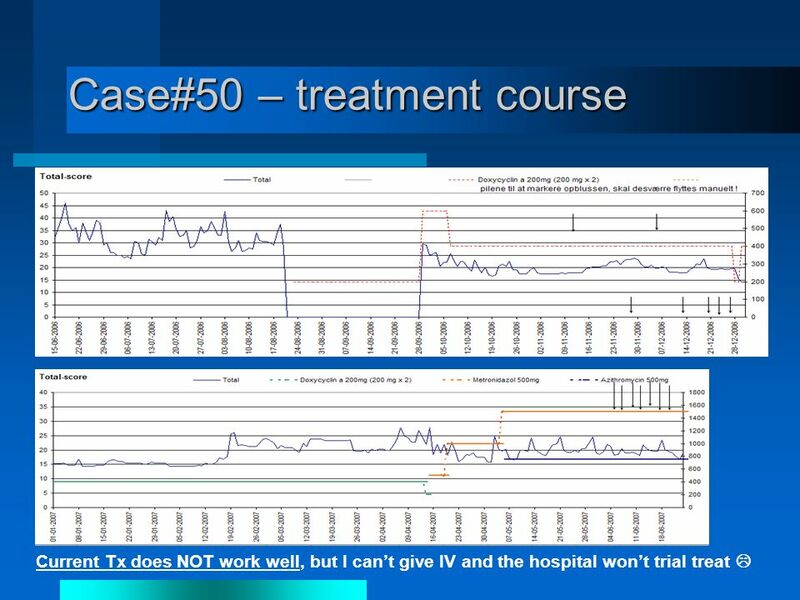 blood during course of treatment, both when successful (#49), and during relapse (#50). 23 Questions? 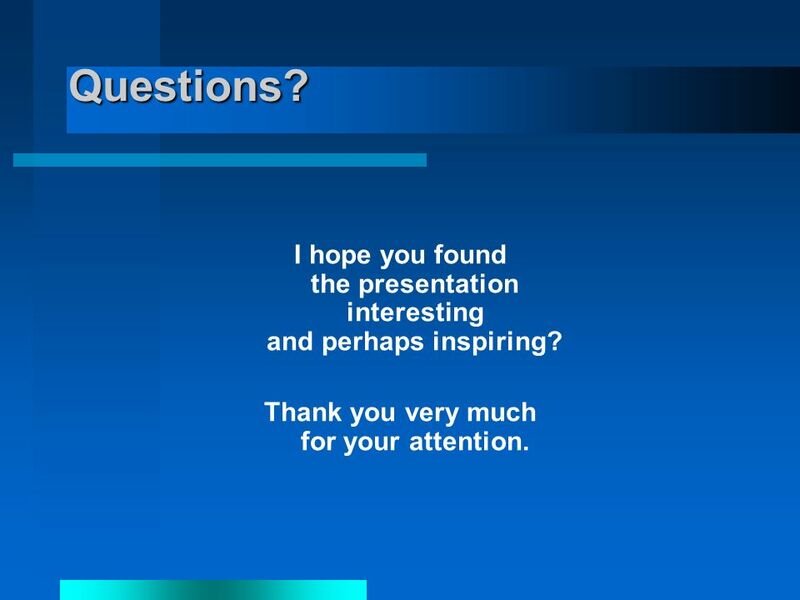 I hope you found the presentation interesting and perhaps inspiring? Thank you very much for your attention. 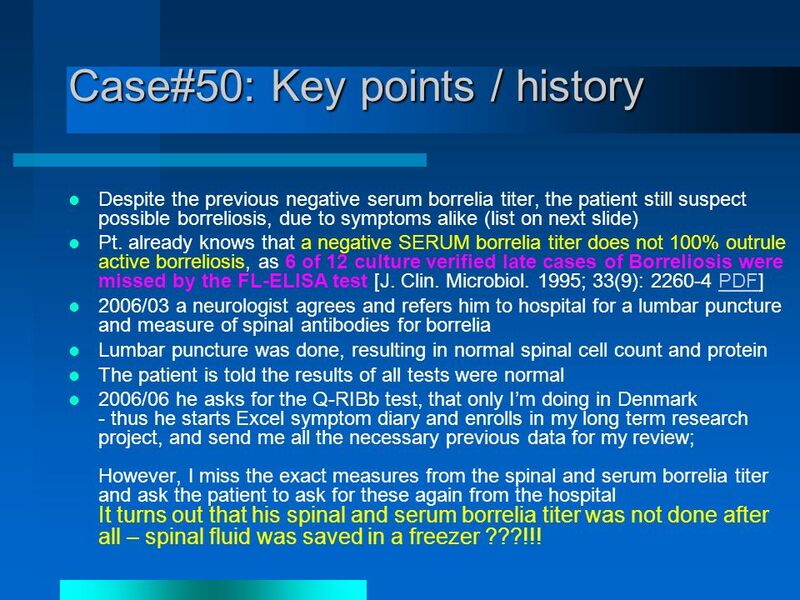 Download ppt "Bowen test project Excel Symptom Diary Case#49 & Case#50 Marie Kroun, MD – Odense, Danmark LymeRICK (Eng. ): Project." 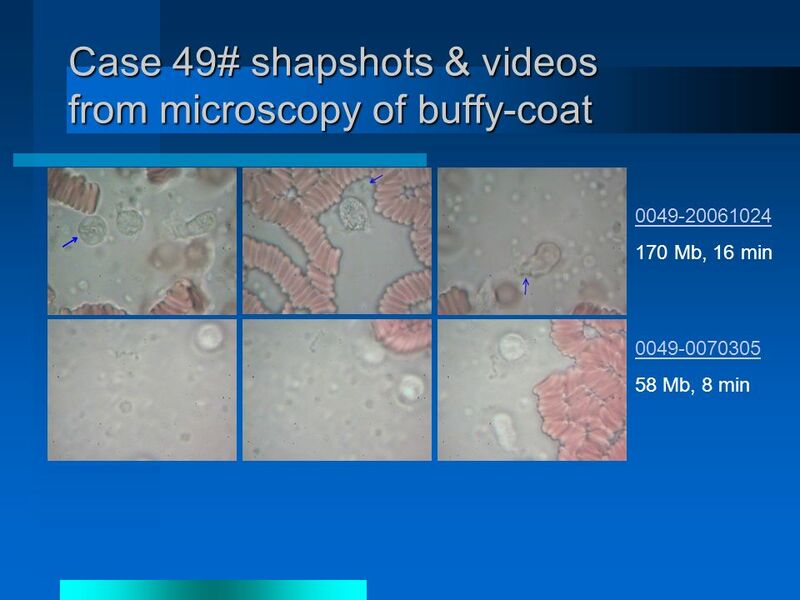 A pilot study on …… Granulated cellular structures and other abnormal microscopy findings in blood from chronically ill patients.. Marie Kroun, MD, Denmark. Pilot project Case 1 Marie Kroun, MD – Denmark Presentation in York, UK – June 2004 LymeRICK – lots of info on TBI: Project website. This slide set “Hand Hygiene in Healthcare Settings-Supplemental” provides: Slides that may be used in conjunction with the “Hand Hygiene in Healthcare. Duration of Serum Antibody Response to Seasonal Influenza Vaccines: Summary The level of antibody response made to seasonal influenza vaccines depends. RED FLAGS IN HEADACHE; A HEADACHE FOR THE MAU DOCTOR FAYYAZ AHMED FAYYAZ AHMED CONSULTANT NEUROLOGIST HULL & EAST YORKSHIRE HOSPITALS NHS TRUST. Case year-old female From South Asia In UK 8 years Living in London. Acute Pyogenic Meningitis. Mrs. S.N: 67 years old Caucasian 103 lbs 5’4’’ Smoker (1/2 pack per day for 45 years) vaccinated for influenza six months ago.